The university crest is a stylized representation of a new life and a Phoenix leaf. Some minor adjustments were made to a design by one of the students of the Faculty of Engineering which was chosen in a university-wide design contest, and it was finalized in 1956. The phoenix is a sacred bird in Egyptian mythology that, after living for 500 years, set itself on fire within its nest and rose renewed from the ashes. The immortal bird is a symbol of Hiroshima University, which was reborn out of the ashes of Hiroshima City after it was laid to ruin by the atomic bomb. The university song was established in 1957. The lyrics are based on the submission of Mr. Sumito Yamanaka, a student of the Faculty of Letters which was chosen in a university-wide contest. The music was composed by the Music Department at the Fukuyama Campus of the Faculty of Education where Mr. Shinichi Takata, a former conductor of the NHK Symphony Orchestra, was a professor. The lyrics are simple and elegant, with the first verse beginning with the words, "There is light," the second with, "There is flow," and the third with, "There is green." The last words of each verse are, "Our hope is to seek truth," "We gather to strive for the good of the world," and "Our wish is to pursue beauty," respectively. These words express the unwavering desire to pursue truth, goodness, and beauty. 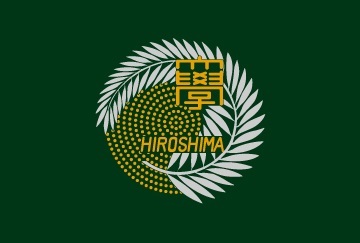 The university flag is green, representing rebirth from the ruins left by the atomic bomb, and has the school logo in the center. It was adopted in 1960. University Identity (UI) questions anew the individuality and the meaning of the existence of the university by asking, "what is Hiroshima University and for what purpose does it exist?" Then it adjusts and reorganizes the philosophy of "what does the university desire to be both now and in the future?" Then, using messages and symbols that embody those ideals in a unified way, the new brand image of Hiroshima University is established. Through language and design, Hiroshima University is carrying out communication activities to promote the establishment of identity in the minds of faculty and students. In Phase 1, questionnaire surveys were conducted to formulate HU's Identity Strategy and Action Plan. The purpose of the survey was to understand how the faculty and students, the university constituents, as well as other related persons such as businesses, the community, alumni, and parents, perceived HU and what hopes they have of the university. Based on the analysis of these surveys, and through comparisons with other universities and establishing HU's Vision and Midterm Goals, it was made clear that HU should work toward gaining differentiation and predominance. In Phase 2, in addition to the words which express the ideal of the university as derived from Phase 1, "A university which fosters human resources with the desire to take on challenges and make things happen," concrete concepts and a communication mark (logo) were designed which express the essence of Hiroshima University using keywords such as the university founding spirit and university principles, goal achievement, Hiroshima, people, and the fusion of education, research, and community cooperation.